One of the things that’s hardest about riding a bike is just getting on the silly thing. Its cold, its hot, can’t fit all the bikes in a car, etc etc… You can bring this to a head by joining a local bike group. I am a member of BIKEast in inner Sydney. They are the elected community group that has a say in any bike infrastructure in the complicated eastern suburbs of Sydney. It is a difficult job. Another thing bike groups do is organise bike rides in the local area and sometimes further afield. Probably all the bike groups in the world do this. So why not join one of these groups and use that to get motivated and organised. In Sydney look for Bike Marrickville, Bike North, Noobs, Liverpool bicycle users group, Sydney Night Riders and so on. Some bike groups will consist of strong riders so ask what kind of rides they do. If its beyond your capabilities, they will likely suggest a group to join. This brings me to the BIKEast ride at Wollongong this week. Everyone except me got on a train and headed for Thirroul where we started. Nine of us rode through Wollongong then around Port Kembla and then down to Shell Harbour. I raced off to Minamurra after lunch and we all headed back on the train. The rides in this area are fantastic. Its shared path all the way bar three kms of back roads. We did more than 50km and this was a record for a couple of riders. Half the crew had eBikes, 3 road bikes and a tiny thing that our fearless leader Adrian rides. It was a great day, next time I will take the train. So if your bike is gathering cobwebs, oil it up, check the tires, join a bike group and get motivated. 55km one way trip. Not hilly. 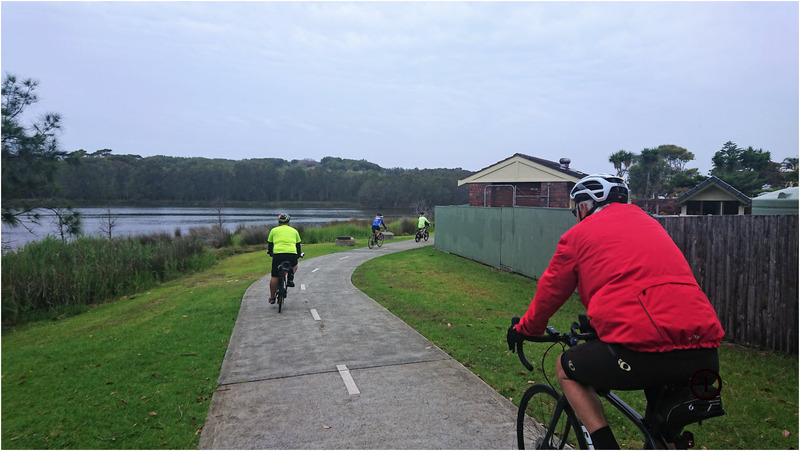 You can ride any bike on this trail..
What is the best cycle area near Sydney ?